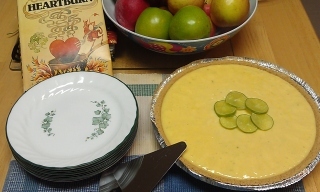 Here is Nora’s Key Lime Pie taken from her book, Heartburn (1983, Knopf). The film, directed by Mike Nichols (who also directed the fabulous The Graduate and Charlie Wilson’s War), stars Meryl Streep as Rachel, a food writer, who marries the philandering political reporter, Mark. She is what we’d call a “foodie” nowadays, and like Ephron in real-life, she is known for her skills in the kitchen. 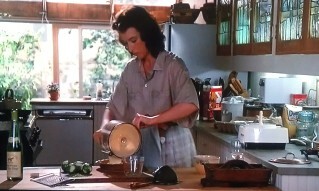 But unlike the novel, the movie doesn’t really highlight her culinary prowess. I didn’t get any good “action” shots while making the pie. So here’s Meryl Streep making it on screen in “Heartburn”. And that’s where the novel has an edge over the movie. Because it’s not just a typical novel. Interspersed within the story are Ephron’s own recipes. I have made almost everything she writes about in the book; her linguine a la cecca is a summer staple in my home, and her famous vinaigrette is my go-to recipe when I need a tart, homemade dressing. I keep my copy of the novel with my cookbooks. 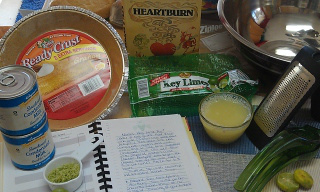 But my favorite recipe is her Key Lime Pie. If you’ve seen the movie, then you’ll remember the pie that Rachel throws in Mark’s face as her character finally realizes she has to make the hardest decision of her life. This is that pie. And this is Nora’s recipe. I only made two slight adjustments: the original calls for 1 cup of lime juice and 1 TBS lime zest. I used ¾ cup lime juice and 2TBS zest. A microplane grater and juicer will make your life easier! *Since this recipe calls for raw eggs to be used, it is best to use pasteurized eggs. These are pricier and a little harder to find than your regular store-bought eggs. The chances of contracting salmonella are about 1 in 20,000, so relatively small (.005%). But, I advise you to get the pasteurized eggs in any event. Or, if you are up to it, pasteurize your own eggs!